"When the month of Av enters, we minimize in joy" —the Talmud. The first nine days of the Hebrew month of Av, culminating with the fast of Tisha b'Av, observed on the date when both Holy Temples were destroyed, are the blackest days on the Jewish calendar. These are days of national mourning, when we contemplate the nearly 2,000-year-long galut, the physical and spiritual displacement of our nation. Though festivities are inappropriate for these days, there is one avenue of joy that is permitted—joy associated with serving G‑d, the joy of a mitzvah. In fact, the celebration of certain mitzvot overrides the sorrowful nature of the moment, and calls for a seudat mitzvah—a celebratory mitzvah meal during which course the mourning practices of these days are relaxed. One such joyous occasion is the participation in a siyum (the completion) of a tractate of the Talmud—which is both a mitzvah as well as an academic feat worthy of celebration. The Lubavitcher Rebbe, of righteous memory, spoke of the need to shine a beacon of light on these days of darkness The Lubavitcher Rebbe, Rabbi Menachem Mendel Schneerson, of righteous memory, spoke of the need to shine a beacon of light on these days of darkness through participation in a siyum during each of these nine days. The Rebbe asked his followers to share this joy with others, and as such encouraged public siyums and even the broadcast of siyums on the radio. Transmission over the radio – and today, the web – multiplies the joy a thousand-fold by allowing for the participation of those far beyond the confines of the particular building in which the siyum is held. Though these days heralded an exile rife with persecution and spiritual estrangement, it is our belief that ultimately this is for the good. Very soon, with the coming of Moshiach, we will understand that all the suffering was necessary in order to reach the ultimate good. At that time, these sorrowful days will be transformed into days of joy. Rejoicing at a siyum hastens the day when these days will be universally celebrated. The Sages have said that the primary reason for the Temple's destruction was the lack of love and harmony between Jews. Sharing in the joy of another, the one who completed the tractate, is a demonstration of Jewish unity—which reverses the cause for our predicament, and therefore brings it to an end. 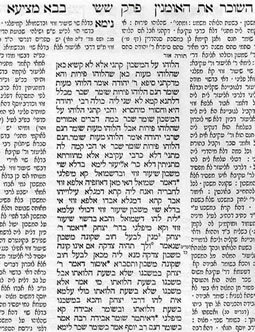 In his later years, the Rebbe requested that the siyums should continue through the 15th of Av—the holiday which celebrates the "upward rebound" from Tisha b'Av. For many years, the National Committee for the Furtherance of Jewish Education has organized siyums on the radio in New York City. The effort was spearheaded by Rabbi Y.Y. Hecht, who passed away in 1990 on the 15th of Av. Chabad.org is delighted to partner with NCFJE to offer a live videocast of the daily siyum. Click here to access the daily live siyum and archives of past broadcasts. Thank you for this article. Chabad.org has been a great source of wisdom, understanding and knowledge.